Thousands of operating hours and/or millions of miles traveled represents millions of gallons of fuel, thousands of barrels of lubricants and tens of thousands of man hours for maintenance. 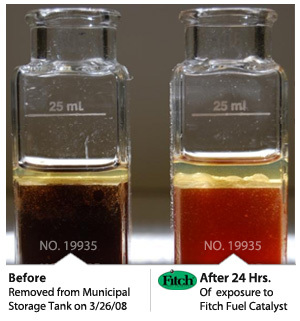 The Fitch Fuel Catalyst effects a significant reduction of all three. Field and lab tested vehicles range from 5-12% in fuel savings. The financial impact in fuel savings alone is significant, not to mention the savings for motor oil which will last longer due to a cleaner, cooler operating engine. The resultant efficiencies include less wear, less time and cost for maintenance, less down time and a major increase in travel time between overhauls. The product is warranted for 500,000 miles, 10,000 hours. It pays for itself many times over. The Fitch Fuel Catalyst insures that fuel is in its optimal condition for combustion, allowing an engine or a burner to extract the maximum amount of energy with the minimum emissions per Kg of fuel. 6. Return on Investment: based on average truck fleet usage & heavy equipment. To the right a photograph of diesel fuel that was provided by the City of Torrington, town garage from their 10,000 fuel tank. We split the fuel into to glass containers and put a Fitch in one and not in the other, and sealed them to let sit. After 24 hours, we poured the contents of each container into the glass flasks you see in the photo. The one on the right was treated with Fitch and the one on the left was not. It really is a NO BRAINER, which fuel will burn more completely in an engine and operate more efficiently? The fleet maintenance manager of the City of Torrington was very impressed and installed Fitch units on DOT trucks with Cummins ISM 320V 7600 Series engines. The Fitch Fuel Catalyst has been certified under the EPA Voluntary Aftermarket Parts Certification Program 40CFR85.2114. As a result of this certification, warranty coverage may not be denied based on the presence of the Fitch Fuel Catalyst. Letters are on file from the following manufacturers of diesel engines stating that the presence of the Fitch Fuel Catalyst will not void their new engine warranty. The FHDG Units are specifically designed for "Heavy Duty" use in diesel and gas applications. These Super Heavy Duty units are warranted for 500,000 miles, 10,000 hours..
For a fleet wishing to conduct an evaluation of the Fitch Fuel Catalyst, the most accurate way is for a diesel technician download the fuel usage information from each on board truck computer which will provide accurate information, eliminating variables from in field calculations. Fitch recommends this method for the evaluation in order to gather good statistical numbers. Downloading this information allows the isolation of very important data like fuel usage during idle time, 1000 rpm, 2000 rpm, 3000 rpm, steady state, etc. Once this information is gathered, retrofit the trucks with Fitch and collect this same data over a few months. This will provide very accurate data and will easily reflect the benefits of the Fitch Fuel Catalyst which tends to range between an increase of 5% - 10% on most all commercial diesel engines. 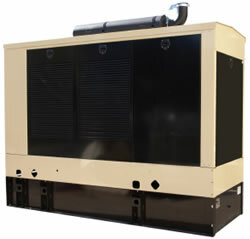 If you have a power generator, large or small, Fitch Canada has a Fitch unit for your application. 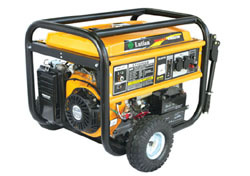 From small home generators that take "Drop-in" applications to huge 50,000 horsepower industrial units, if your generator burns fuel oil, gasoline, diesel or propane we have a catalyst to save you money and provide an excellent return on investment. Below these are downloadable .PDF files and may require Adobe Reader 6.0 or 7.0 to view completely. FTS Diesel Industrial Drop-in Units Diesel Engines - These “Heavy Duty Sleeved Industrial Units” are an alternative to the Bolt on In-line units. These “sleeved units” can be inserted directly into the fuel tank, cutting costs of installation time. TIMBERJACK PROCESSOR: 5.9 L CUMMINS. Used by many other large US companies as well. Back to On-line store click here! I primarily want to endorse the Fitch Fuel Catalyst with this correspondence. We have been testing the Fitch for over a year now. We got incredible initial results on two 1000R Mi-Jack cranes equipped with Detroit 6-71's and later model 900R Mi-Jack cranes equipped with the Detroit Series 50 DDEC systems. Our testing showed concrete fuel savings of no less than13%. We also had Detroit Diesel perform independent evaluations with their own software confirming the results. Without getting into too much detail, I simply want to encourage you to perform your own test(s). I am confident you will achieve the same results. With rising fuel costs, this can be a great opportunity for your organization as well as put a feather in your caps as well. The benefits go deeper. With new emissions regulations around the corner that will affect off-road applications, this product will assist you in getting within standards. Once installed and past the two week break in or conditioning period, you will see little or no colored exhaust from your machines, even at start up or when you switch to high idle. The third benefit of the entire package is increased horsepower because more complete combustion of your fuel increases the life of your power plants since you are operating more efficiently. Your lubricating oil sample results will confirm this. I recently failed a motor after 15,000 hours. I installed the Fitch last May when the machine had several thousand hours clocked on it already. I believe I would've achieved at least another 1,000 hours, probably more, had the Fitch been installed when the engine was new. We have made the Fitch a specification for any new equipment we purchase and are developing a plan to retro-fit our entire fleet. The Fitch performs on all applications. Testing is currently being done on a locomotive in the Midwest and preliminary results are positive. It is effective in automotive and diesel highway truck applications as well. Independent testing has been performed with similar results to what we have achieved. In the spring of 2007 we installed Fitch Catalyst in 2 Volvo tractors with 12L Volvo engines. Both units were 1 year old with a little over 100,000 miles, consistently averaging 5.8 MPG. Within 2 months of installation the units were averaging 6.5 MPG and are still in that range. On 100,000 miles, that is a savings of 1856.8 gallons of fuel per unit, surely worth the investment. The enclosed Fitch catalyst stopped producing at 570,881 miles. It was 1st installed on a Volvo with a 12.7 SR60 Detroit engine. It went 175,000 miles with a 17% return on fuel. We removed it from that engine and installed it on a 1998 Volvo with the 12.7 SR 60. It went 344,881 miles with a 14% return on fuel. We removed the F500 unit once again and even though we thought we might need a larger Fitch unit because of its great history, we decided to install this same F500 unit onto a 1999 IHC with a 600 Cummins. It lasted an additional 51,000 miles getting between 7% to 8% before it stopped giving a return. Per your recommendation , we have now installed the F750, which is appropriate for our application for the 600 Cummins, and it is working great. Please let me know how the tests come out when you inspect the unit because it went a combined 570,881 miles with a consistant return on fuel. Report on Tigercat Feller/Buncher, Timberjack Porter, Timberjack Processor. (Logging industry equipment) Read more here! Durkee Drayage 3465 Collins Ave. Richmond, CA. "I’ve saved more than $750 a year on fuel since I installed the Fitch* Fuel Catalyst on my delivery van." "With more than 3 years of exceptional performance we can recommend the Fitch* Fuel Catalyst without any hesitation." "We at …….. of South Carolina have been using the Fitch* Fuel Catalyst……we have shown 11% to 14% fuel savings on our vehicles. As a truck owner it’s nice to be able to cut my fuel bills down by 7%. I would recommend the Fitch Fuel Catalyst to anyone who likes to save money!" "After testing the Fitch Fuel Catalyst for three months on one of our school buses, I have found an increase in both miles per gallon and in power. I appreciate the opportunity of being one of the first bus fleets to enjoy its benefits." "We are satisfied with the results we have seen and are making plans to equip all twenty of our power units with your product." 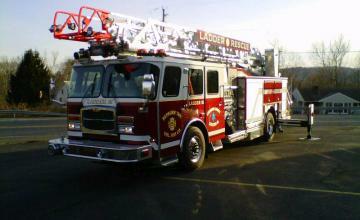 "After testing your unit on a 1990 Mercedes Benz 1319 truck, we found a good increase in power. Fuel consumption went from 10.1 mpg to 10.9 mpg." (8% improvement). " "The fuel economy I have monitored on several vehicles including large gasoline powered buses has improved as much as 18%. As a result of my extraordinary first-hand experience I would recommend the Fitch Fuel Catalyst to anyone." "In an International diesel tractor; before installation, this unit emitted excessive black smoke. After some use, the smoke was eliminated and there was a noticeable increase in power." "We’ve got over 100 units installed and are averaging 7% savings." RT, New York, (Transportation Foreman, Electric Utility Co.): "We tested trucks with the Fitch Fuel Catalyst and averaged 5.54 mpg while the other trucks only got 4.43 mpg average."